Save SAR 35 (50.72%) – Earn 3 Shukrans What is Shukran? Shukran is the Landmark Group’s award-winning loyalty programme in the Middle East, which allows you to earn Shukrans when you shop any of our brands. 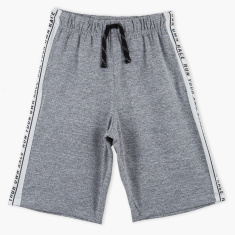 Your little boy will love wearing these comfortable knit shorts that come with a printed woven side tape detail. With a drawstring on the waistband, this pair of shorts is both stylish and attractive.